Today I’m posting a special interview. This is fictional journalist Ian McFae interviewing the characters from High Maga by Karin Rita Gastreich. Enjoy! Moehn seems an unlikely setting for one of the kingdom’s most ambitious projects. A rough-hewn province, its villages are clusters of earthen homes; its people humble in dress and aspect. Cultivated fields grow haphazardly across rolling hills. Wheat and lentils struggle amongst scattered saplings in a constant battle against the ever-encroaching forest. Today I’m visiting an Aekelahr, the first community of its kind in over a generation. A half-finished wall marks the perimeter. Inside, small stone buildings house living quarters as well as a herbarium and library. At the center, a young fir tree has begun its reach toward the sky. On the southern side of the complex, insects buzz through a large garden of fruits, vegetables, and fragrant herbs. My hostess, Maga Eolyn, survived the purges against magas and is often hailed as the last Daughter of Aithne. Her companion, Mistress Adiana, is a talented musician from the province of Selkynsen. You may, perhaps, remember her performances from the days of Mage Corey’s Circle. Though similar in age, Eolyn and Adiana seem very different in disposition. Maga Eolyn comes across as formal and soft spoken, reminiscent of a lynx that prefers the forest deep. Adiana, on the other hand, is restless as a songbird in spring. MT: Thank you both for hosting me today. I’m going to start with a question that may seem obvious, but that many of our readers could probably use a refresher on: What is a maga? Eolyn: Thank you for visiting us, Ian. A maga is a woman trained in a tradition of magic unique to Moisehén, first discovered in ancient times by Aithne and Caradoc. We seek to understand the natural world, the spirits of plants, animals, and rocks, and to use that understanding for the betterment of our people. MT: Sounds noble. Yet not too long ago, the kingdom made a concerted effort to rid itself of everyone who had learned this tradition. Adiana: Fools will be fools. And kings more so, when given the chance. Eolyn: When the magas rose up against King Akmael’s father, Kedehen, the consequences were many and brutal. Here we are trying to put that past behind us and create a new future in magic, not only for the young women who have joined our Aekelahr, but for all of Moisehén. MT: Tell me a little about the women who live here. How do you choose your students? Eolyn: We accept anyone who comes willingly and demonstrates an aptitude for magic, as well as respect for the traditions and teachings of Aithne and Caradoc. Right now we are a small community: five young girls, Maga Renate, Adiana, and myself. But we hope to grow. MT: So, Maga Eolyn, you teach magic, but what role does Adiana have? Why bring a musician to the Aekelahr? Adiana: Aithne and Caradoc, who discovered magic, recognized music as a form of Primitive Magic, the most ancient and complex magic given to our people. It’s true that I was never trained as a maga, but I know music, and I love teaching the girls. This is the one gift that I can offer in support of Eolyn’s effort. MT: So you left the cosmopolitan city of Selkynsen to settle in this remote and rather backward province. Do you ever miss your home? Adiana: I miss the wine. There is no better wine than the wine of Selkynsen. MT: But you don’t regret your choice? Adiana: Not at all. This is the most wonderful community I’ve ever been a part of, which is saying a lot since I was a musician for Mage Corey’s Circle. And let me tell you, that was amazing! But Eolyn has built a strong family her out of a most unlikely collection of orphans and misfits. We love each other and care for each other. The girls who study with us will one day be some of the most powerful women in the kingdom. MT: It’s common knowledge that this Aekelahr would not exist without the very generous support of King Akmael. How did you convince the son of Kedehen to finance this endeavor, to even make it legal again for women to practice magic? Eolyn: My Lord King and I were brought together by very unusual circumstances when we were children. It was on the basis of that friendship that he eventually decided to reverse some of the rulings made by his father. MT: Friendship. A carefully chosen word. Some would call it love. Adiana: Well he is in love with her. Madly. No doubt about it. Eolyn: I cannot speak for the King’s heart, but I can assure you there is no romance between us. MT: Yet there was romance at one time. Would you deny this? Eolyn: Of course not. Akmael – I mean, the King – and I were involved for a brief period some years ago, but that ended before he married Queen Taesara. We have not seen each other since. MT: King Akmael and Queen Taesara are expected to arrive in Moehn in the next few weeks, as part of their summer progress. Any chance of old flames reigniting? Adiana: I would say so. Definitely. Yes. Adiana: I’m just saying! Look at her, Ian. What king wouldn’t be in love with this woman? She’s beautiful! And I know she still has feelings for him. You should see how nervous she’s been with all the preparations. It’s driving the rest of us mad. Eolyn: Perhaps this would be an appropriate moment to bring the interview to a close. MT: As much as I’d like to delve deeper into this question, we are, I’m afraid, at the end of our time today. I’m certain our readers will be anxious to learn what happens in the coming weeks, Maga Eolyn, when you and King Akmael are reunited. Readers of Medieval Times, I will be back soon with full coverage of the King’s long-anticipated visit to the province of Moehn. Until then, this is Ian McFae signing off from the highlands and wishing you a most magical day. Find out more about High Maga here! A couple of years ago, some of you may remember, I had a story published in a fantasy anthology titled Visitor to Sandahl. The second volume, Return to Sandahl, is now available–and it also has a story of mine in it. Please note, these are NOT young adult stories. The stories in both anthologies are set in Methanasia, a world created by C. Lee Brown for his novels about Cable Hornman, a traveling minstrel. The challenge to the writers of these stories was to create a plausible story in another writer’s world. It was hard! In the first volume, my story “Road to Sandahl” featured a young girl, daughter of an innkeeper, whose family inn is burned by raiders. Her parents die and she must make her way to her uncle in Sandahl. This new volume contains my story “Roark’s Raiders” which features the girl’s brother and his adventures as he infiltrates the raiders. It tells the story of the inn burning as the brother sees it. Both books are available on Amazon (links above), as well as Brown’s novel, Cable Hornman, the Bard Begins. Soul Stealer, by Sam Richardson, is a new middle grade fantasy available as an ebook on Amazon for $.99. The characters of Eve and Barney are extremely relatable for middle grade readers. In Eve and Barney they will see bits of their friends and siblings that will make them laugh and nod their heads. The adventures that the siblings in the book embark on are full of wonderful descriptions and excitement. I like that they had to solve puzzles to get into the worlds they visited. Readers will enjoy trying to figure them out, but the book doesn’t dwell too long on the mystery, which might be frustrating. The image of a hallway of doors, and a key keeper with a robe full of pockets of keys, will stay with me for a long time, as will images from Zoltari. Eve and Barney set off to save the world, and it’s particularly realistic that they don’t completely succeed at first. By the end of the book, they have grown a bit even though they still have a ways to go before they are fully grown up. I can see a terrific series developing around Eve and Barney as middle grade readers discover them. My students had the opportunity to read this book in an early draft, and will be quite excited to see that the author incorporated some of their suggestions into the final draft. Emily Thompson is the author of the Clockwork Twist series. Book 1: Waking is available now, and Book 2: Twist comes out January 14, 2014. I probably spend about half of my free time writing, or at least thinking about my stories. I forgot how to flip that switch off a while ago. But when I’m not actually working on my books, I love to read a good book, go out to see a movie, or sit at home and marathon sci-fi TV on Netflix. I find that in-taking copious amounts of stories and media helps to keep my muse in fighting form. Plus, I’m a serious sci-fi/fantasy TV junky. As a Steampunk writer, my first instinct is to say Jules Verne. But I must admit that although I adore Verne and have read nearly all of his books that I can find (in English), he isn’t actually the writer who I most look up to. His characters are lovely, his stories fantastic, and his style is charming. But I can’t read French, so I can’t really appreciate his voice without a translator. When I really think about the artistry of the English language, I go right for Oscar Wilde. There are many great writers in our language who can inspire and challenge us to grow as artists, but I’ve read sentences by Wilde that make me just stop and stare in awe. There’s a grace and depth to Wilde’s writing that really speaks to me, and it represents a level of care that I often feel is lacking in more modern English writing. If I could hone my craft through diligent work and study for the rest of my life, then someday I might just be able to write half as well as Wilde. And that is the goal I strive for in my writing. There are two new authors I simply adore. One is Tana French, who writes some of the best psychological mystery novels I’ve ever seen. Her stories feel real and honest, even when things start to turn toward insanity. Like Mary Shelley, Tana French can turn her characters slowly mad with such finesse that you start to taste what it would feel like to lose your mind, yourself. Her books are wonderfully creepy, without a moment of gore. The other author I love right now is Félix J. Palma. He bends literary rules to their breaking points, smashes the forth wall to bits, and his books are unrelentingly long. And yet, I adore his work. Even the very first few pages of The Map of Time glimmered and crackled with powerful writing magic. I was swept instantly into his story, and forever delighted and surprised throughout. I swear he is the reincarnation of Verne, upgraded for modern Steampunk. I find it interesting to know what environment people write in. Do you use a pen and paper, laptop? Quiet room, music or what? I love to write in a café. I’ve got a simple, slow, but light and reliable little laptop that I take with me to various coffee shops around where I live. Some trip-hop or chillstep playing on my headphones, a decent cappuccino, and a handful of undisturbed hours is all I really need to get the pages done. Sometime I try to write in other places, but it’s never as easy for me. I think I’ve trained myself by now that café time = writing time. There’s a tendency in Steampunk, and a lot of other modern fiction, to go the gritty dystopian route. I love a good goggles and zombies story as much as the next person, but I don’t like to see a predominance of one type of book in the genre. For me, Steampunk is also brilliant for escapism. What other genre has airship pirates? So, when I first set out to follow Twist around the world, I made a conscious decision to keep delight and wonder at the forefront of the story. Things don’t always go smoothly for Twist, and he’s going to face quite a few difficulties and dark moments in the future books, but every trial he encounters is put in place to help him to grow and I make sure he enjoys the results. The only thing that I want people to take away from my books is a sense of adventure, and a truly good time. What sort of Starbuck’s coffee would your characters order? What a lovely question! I would imagine that Twist would order something simple, non-sweet, and bold: a double, dry, cappuccino perhaps. The clockwork princess doesn’t have a stomach or taste buds, but if she did I’m sure she’d get something like a strawberries and cream Frappuccino, with extra caramel sauce and whipped cream. Jonas Davis, on the other hand, wouldn’t be happy with something easy. He’d probably get a no-water chai, with an ad-shot or two, and a pump of mocha just for fun. READ MORE FROM EMILY THOMPSON ON HER WEBSITE. In true Neo-Victorian style, Clockwork Twist is set in a lush and vibrant world where things are as you might expect in 1878. That is, of course, if fantastic creatures like djinn, faeries, kitsunes and vampires were commonplace. An increasing number of people are being born with supernatural senses, called Sights. While airship tourism is sweeping the globe, air-piracy is also on the rise. Set out with Twist on a harrowing journey across the world, stopping at the flying sector of Venice, the bottom of the Caspian Sea, a mountaintop palace in Nepal, an airship pirate-filled Hong Kong, and the crystal caves of Indonesia in this first installment of a long running series. Find out first hand if Twist can actually handle any of this, or if he’ll loose his grip on sanity in the first few days. Twist wasn’t the only one who wanted to find the clockwork princess. Having finally rescued Myra from obscurity and ruin, Twist and Jonas must now flee Bombay and return to Europe in a desperate attempt to secure her freedom. Continuing the story of Clockwork Twist, Book Two: Trick, follows the unassuming clockmaker and his companions as they are pursued across the globe by a mysterious and shadowy society of technology thieves. The Rooks would stop at nothing to posses Myra and all of her clockwork secrets. Join Twist once again as he encounters wonders and absurdity beyond anything he could imagine, in this exciting steampunkadventure. Travel with him across the Arabian Sea, through Egypt, and back into Europe by airship, steam train, and sailing ship. Meet a whole new cast of characters, and re-encounter old friends and enemies, as Twist struggles to retain some semblance of sanity in his bizarre new lifestyle. The intrepid three are joined along the way by magical beings of both human and mythical natures, underground kidnappers, notable inventors, and a safari enthusiast. But friends can only do so much to aid them. In the end it’s up to Twist and Jonas to protect their princess and all of their hopes of having a future together. Happy release day! My flying horse novella, a prequel to my trilogy, is now available for Kindle! This weekend, Thursday through Monday, it will be a free download. Get it then! A New Review For My Book! 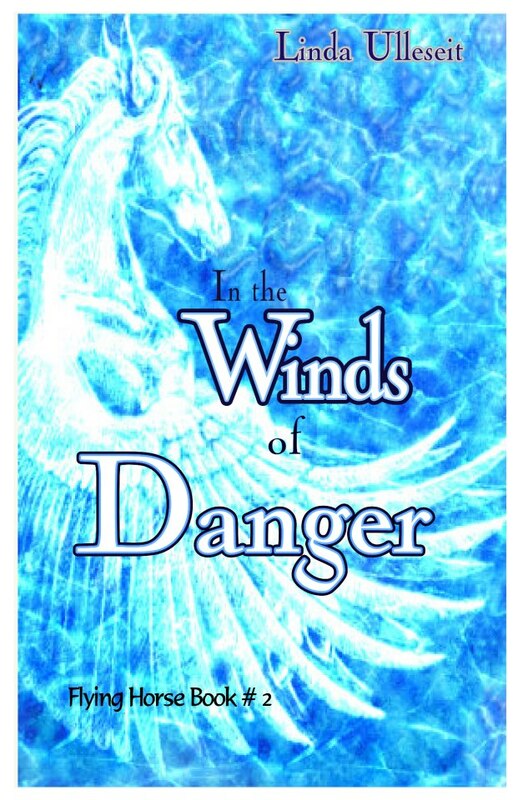 In the Winds of Danger has been ignored a bit while I spend the summer writing something new. Here is a review from J.A. Campbell, a horse lover and author of books about horses who time travel. She hasn’t read On a Wing and a Dare yet, so it’s interesting to see what she thinks of book two. Meanwhile, I’m working on Wings Over Tremeirchson, which is a novella (short novel) telling the story of Hoel and Neste, Emma’s parents. Click on the link below and read Campbell’s review. It will help pass the time until my new one is released!